More than any other birthstone gem, the magical, mystical October birthstone gives flight to the imagination, and the heart. - all shining together in incredible union. others the flame of burning sulphur or of fire quickened by oil. There are two theories going around as to the origin of the name opal. The first one is that opal is derived from the Latin word "opalus", meaning a stone from several elements. According to second theory the word opal comes from "upala", a Sanskrit word meaning a valuable stone. The Greeks regarded the opals as a sign of purity, love and hope. The Romans believed opals kept the wearer safe from harm and called opals "cupid paederos" meaning child as beautiful as love. The Arabs believed that opals fell from heaven in flashes of lightning. Then again Cleopatra is said to have worn an opal to attract the attention of Mark Anthony. An opal is suppossed to help against problems with the eyes. It is also suppossed to enhance your creativity and imagination. Opals are said to increase your confidence and happiness. The gemstone helps the wearer find happiness, love, good fortune and favour in the courts. Opal enables the wearer to foresee minor illness and this is indicated with the opal turning dull and grey. Opal turns sickly yellow when injury or accident is imminent. 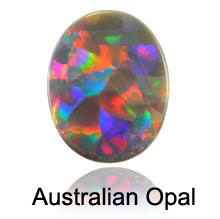 Black opal is regarded as an extremely lucky stone. In ancient times opal was accepted as a symbol of faithfulness and confidence. It had a reputation for it healing properties, especially increasing mental capacities such as creative imagination. Black opal worn near the heart on necklace made of gold is said to protect one from the evil eye and protect travelers on journeys to faraway lands. Symbolic for hope, balance, endurance, safety and also to make one more calm and peaceful, pink tourmaline is the traditional / alternative birthstone for october. 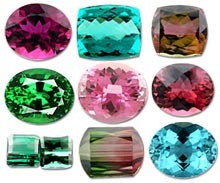 Sometimes tourmaline is used as a birthstone for october as it comes in many colors such as blue, yellow, pink, red, black, green and clear - but primarily in pink and green. It also occurs in color combinations within single stones which accounts for its popularity. Its a gemstone that exhibits the broadest spectrum of gemstone colors. Gem-quality forms of this mineral have in the past been misidentified as rubies, emeralds and sapphires. It is also accepted as a gemstone for the 8th wedding anniversary.